LEED-certified buildings can generate a 7 to 12 percent increase in net operating income by reducing operating costs. As these buildings hit the market, they will have to be bought, sold and insured; but for how much? Companies with green buildings will merge and will need to know who has what, what to keep and what to sell; but for how much? Companies with LEED buildings will go bankrupt (though hopefully not because of their buildings!) and will have to liquidate their assets, including their real estate; but for how much? Inevitably, these buildings will need to be appraised, but the appraiser might not know how to do it correctly. If the appraisal industry were a high school student, he would like math more than theater. He would prefer the safe, predictable and calculated laws over the new, daring and startling theories. And because currently accepted appraisal principles were built in the past, it takes some finesse for the appraiser’s methodologies to mesh with LEED-certified build­ings of the future. Long before anyone knew what a graywater system or green roof system was, the appraisal industry developed three sources to support their value opin­ions: 1) analyzing and adjusting recent sales of com­parable buildings (the sales comparison approach); 2) estimating the price of building components and accrued depreciation (the cost approach); and 3) using potential revenue and expenses to calculate an expected income and investment payback (the income capitalization approach). To be fair, these systems are very appropriate for con­ventional building valuation, not to mention required under industry guidelines. Current appraisal standards were made to protect clients from wildly variable opin­ions and make sure everyone in the industry was using a properly sized yardstick. But when a LEED-certified building, a new type of product, enters into the ap­praisal equation, it can make the sales comparison and cost approach difficult to apply. For the sales comparison approach, if there are no comparable buildings because no other LEED-certified buildings were bought, sold, listed or even built within a reasonable distance of the subject property, the quality of the appraisal may be low if proper adjustments are not made. When using the sales comparison approach, the appraiser should employ ways to quantify the premium characteristics and price for a LEED-certified building. Also, the cost approach would have to be carefully applied to LEED-certified buildings. The appraiser would be wise to use actual construction costs instead of building cost averages from sources such as the Marshall and Swift Building Cost Index, as some LEED features are quite different from the industry standard. Furthermore, unlike conventional buildings, LEED-certified buildings push forward costs in equipment and technology to save on utility bills and replacement in the long run. Many LEED features, particularly those that have been commis­sioned by a third party to verify proper installation and maintenance, should have lower depreciation rates than standard features.9 The cost approach would be particularly tricky to apply to a LEED-certified building as it gets older. Since the LEED program has only recently been put into place, de­preciation rates for LEED-certified building features are not widely available beyond anecdotal evidence. Further, using the cost approach for an older build­ing of any type with a large amount of depreciation adds uncertainty. To reliably use the cost approach for an existing building, a prudent appraiser should accurately calculate a LEED-certified feature’s ef­fective age, which measures overall condition and utility, as opposed to its actual age. The income capitalization approach is the LEED-certified building appraiser’s best line of attack, as it includes the building’s lower operations costs. The appraiser would have to evaluate the degree of acceptance and understanding the local real estate market would have for LEED features. Next, the appraiser would have to evaluate how much tenants would be willing to pay in additional rent for those improvements. A popular appraisal analogy goes: A swimming pool installer adds a beautiful pool worth what she would consider $15,000 in her backyard in a mid- to low-income neighborhood. She is quite surprised when she decides to sell her house and finds that the appraiser did not deem her house worth $15,000 more than her neighbor’s nearly identical house. An individual component of a home does not neces­sarily contribute an equal incremental value to the house, as it depends on the local market’s demand, willingness to pay and acceptance of such a feature. An appraiser should consider that tenants may enjoy a LEED feature such as a rooftop garden that filters water and helps control erosion, but they may not be willing to pay the full cost of this feature.10 Yet, LEED-certified buildings are also an enigma in that the converse of this example could be true for some components. If an energy-efficient device is installed in a LEED-certified building, the savings on that fea­ture could potentially translate into financial benefits that exceed the cost of the product. An initial investment of 2 percent in green design can benefit the owner tenfold in savings. Just as developers, architects and owners who adopt LEED standards before the pack will reap the benefits of offering a new and novel product before the mar­ket is flooded with late adopters, so too will the real estate appraisers who, early on, develop a high-level understanding of LEED. Golf courses and hotels have their own appraisal categories, so why should not LEED buildings – a highly specialized “Super Class A” – have their own valuation approach?11 Green build­ers will be frustrated and discouraged if the valuation profession naively applies a one-size-fits-all approach to what should be a discerning, tailored fit. By becoming a LEED Accredited Professional (LEED AP), appraisers announce to their clients that they know the features necessary to certify a green build­ing and that those efforts will not be overlooked. A qualified appraiser must be able to identify building features that add value and those that do not. For example, it is fairly straightforward to do a calculation proving that increased energy efficiency will lead to a higher net operating income, which would increase a building’s value. But what about a do-gooder component, such as providing an alterna­tive fueling station before the market demands one? Another difficult-to-navigate component of a LEED building appraisal could also be the value of the land if it is thought to be contaminated (a brownfield). Some developers would see a net financial benefit with brownfields, due to low purchase prices and incentives such as tax increment financing. However, these remunerations are often localized and only available for a limited number of years. Furthermore, there is a great deal of risk with taking on a clean-up project, especially if local governance requires a strict standard of revitalization. If necessary, both the appraiser and owner should investigate the costs and benefits of a brownfield site. Appraisal clients should also take heed and educate themselves about potential valuation issues when planning a building project. Building industry profes­sionals should proceed with caution when choosing not to LEED-certify a building to avoid certification costs, then claiming the building is “able to be LEED-certified” at some level. Most appraisers are not engineers, inspectors or architects, so their ap­praisal clients should not expect them to verify any level of LEED readiness. Appraisers are able to add a caveat to an appraisal, saying they assume a build­ing meets LEED certification requirements. However, this practice could be littered with red flags. Just as you would not want someone to perform surgery on you who claims he could pass the medical boards but hasn’t done so because it’s expensive, it’s hard to assume that a non-certified building fully performs at LEED standards. It would be irresponsible for an appraiser to present an equivalent LEED-certified building value for a structure that has not gone through the certification process. The LEED system does include many other third-party certification programs, including Forest Stewardship Council wood, ISO recycling content standards, Green Seal paints, etc. Furthermore, third-party commissioning of systems is encouraged as a way to achieve LEED certification and to verify that expensive equipment and building components function as planned. To the degree that a non-certified building follows these other standards, it will perform more akin to a LEED-certified building. Although LEED-certified buildings are inconvenient to appraise for many valuation professionals, this difficulty offers an incredible opportunity for apprais­ers to specialize and differentiate themselves in the market. Further, there is a change in climate looming, and you do not have to believe in global warming to believe it is coming. Green buildings may become the standard instead of the outlier. Both real estate practitioners and their analyses have communicated that there is only a short window of time before incentives and rebates for green buildings transform into requirements and penalties for noncompliance,16 so appraisers should update their training before the real estate market outpaces their skill set. It seems quite certain that LEED-certified buildings will equal green for knowledgeable appraisers. FHA's list of PowerSaver-approved lenders includes Admirals Bank; AFC First Financial Corporation; Bank of Colorado; the City of Boise, Idaho; Energy Finance Solutions; Enterprise Cascadia; HomeStreet Bank; Neighbor's Financial Corporation; Paramount Equity Mortgage Inc.; Quicken Loans; SOFCU Community Credit Union; Stonegate Mortgage Corporation; Sun West Mortgage Company Inc.; The Bank at Broadmoor; University of Virginia Community Credit Union Inc.; Viewtech Financial Services Inc.; WinTrust Mortgage; and W. J. Bradley Mortgage Capital Corporation. Further, officials suggested that use of blanket schedules for fees within states may not rise to the requirements to satisfy both “customary” and “reasonable” as defined by Presumption 1. Separately, he officials also reiterated the provision of the Interim Final Rule that states that just because an AMC requires an appraiser to sign a document indicating that the fee that they are paid for an assignment is customary and reasonable does not necessarily satisfy the AMC’s responsibility to ensure that an appraiser is actually paid a customary and reasonable fee. The Interim Final Rule defines two separate presumptions of compliance. Presumption 2 relies on fee schedules adopted by government agencies or independence organizations and is more consistent with the statutory language found in the Dodd-Frank Act, whereas Presumption 1 requires adherence to a review process of several factors. In determining this amount under Presumption 1, a creditor or its agents shall review the factors and make any adjustments to recent rates paid in the relevant geographic market necessary to ensure that the amount of compensation is reasonable. These factors include the type of property, the scope of work, the time in which the appraisal services are required to be performed, the fee appraiser qualifications, the fee appraiser experience and professional record and the fee appraiser work quality. Some have speculated that creditors and their agents may not be interpreting the lengthy explanation in the preamble for the customary and reasonable fee rule. Doing so may be place the creditor at risk of significant fines and penalties. Unfortunately, it is up to an appraiser to proactively rebut Presumption 1, and it’s not clear what information is necessary for a satisfactory rebuttal. Federal Reserve staff indicated they take complaints on this issue seriously, although no word was given on whether the Fed plans to issue any clarifying guidance regarding Presumption 1. Maloy indicated that AI’s Government Relations Committee is undertaking a thorough review of the facts and is embarking on a multi-faceted campaign to help ensure that Congress’ intent is carried out. In related news, the Appraisal Subcommittee released information on April 15 on where appraisers can direct questions and comments regarding the issue of appraisal independence. According to a notice posted on the agency’s website, the appropriate agency to receive an appraiser’s concern about a creditor’s compliance with the Truth in Lending Act, including the creditor or the creditor’s agent paying an appraiser a customary and responsible fee, is the agency that enforces TILA for the creditor. If the agent or appraisal management company is affiliated with a federally-regulated creditor, the appropriate agency to receive complaints against the AMC is the affiliated creditor’s federal regulator. If the agent (or AMC) is not affiliated with a federally-regulated creditor, the appropriate agency to receive the complaint is the Federal Trade Commission. The ASC notice states there are two websites that appraisers can use to find the federal regulator for a creditor. Visit the Federal Reserve System – National Information Center website at www.ffiec.gov/nicpubweb/nicweb/nichome.aspx and the FDIC website at the “Bank Find” webpage at www2.fdic.gov/idasp/main_bankfind.asp. Questions regarding the appropriate interpretation of the Truth in Lending Act, including those on customary and reasonable fees, should be directed to the Federal Reserve Board at www.federalreserve.gov/feedback.cfm. In Boltar v. Commissioner 136 T.C. No. 14 (2011) the Court excluded the developer partnership’s experts’ appraisal as unreliable and irrelevant. The Court sustained the IRS allowance of only $42,400 out of $3,245,000 claimed as a charitable contribution deduction on the partnership return of Boltar, L.L.C. (Boltar) for a conservation easement on 8 land-locked acres in Indiana. Boltar’s experts failed to apply the correct legal standard by failing to determine the value of the donated easement by the before and after valuation method, failed to value contiguous parcels owned by a partnership, and assumed development that was not feasible on the subject property. The Court specifically stated that the appraiser qualifications were not in question. What motivated the Court to reject Boltar’s appraisals was the multiple failures and abuses in the appraisal methodology as well as significant factual errors affecting value. The Court stated, “The problem is created by their willingness to use their resumes and their skills to advocate the position of the party who employs them without regard to objective and relevant facts, contrary to their professional obligations.” And later, “…we need not blindly admit absurd expert opinions.” And finally, ” In addition, the cottage industry of experts who function primarily in the market for tax benefits should be discouraged.” At least from the context of the decision, the Court appears to be directing the last comment at those who enable abusive appraisals and tax schemes. Learn more by visiting http://taxtrials.com/, then click on Boltar. Note that this site has many tax opinions available. Federal Reserve Board - Jamie.Z.Goodson@frb.gov; Lorna.M.Neill@frb.gov ; Virginia.Gibbs@frb.gov ; Walter.McEwen@frb.gov ; Will.Giles@frb.gov. When I first saw the complaint filed by the plaintiffs in this lawsuit in federal court in Idaho about a year ago, I thought it was most remarkable for its conspiracy theories and the amount of alleged damages -- $24 billion. 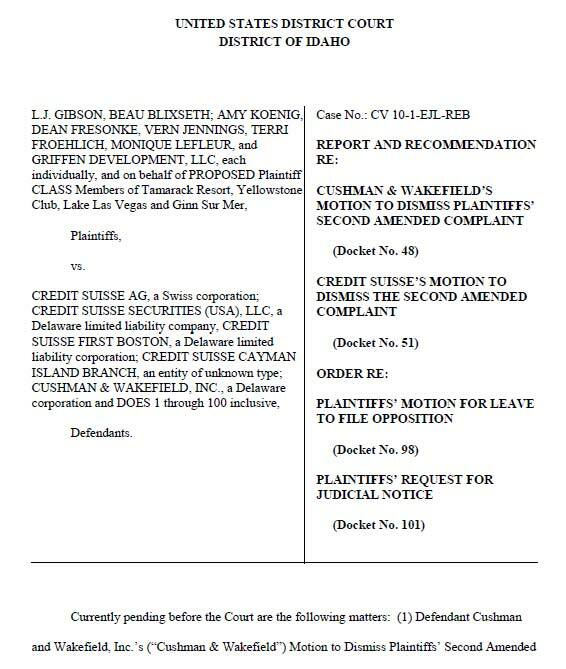 The complaint is a diatribe against bankers at Credit Suisse and commercial appraisers at Cushman & Wakefield, who are alleged to have conspired to create what the plaintiffs call a "Loan to Own" scheme under which Credit Suisse, aided by inflated appraisals, purposely lent hundreds of millions to the developers of four extravagant resort communities as part of an evil plan that the developers would default and that Credit Suisse would then foreclose and obtain ownership of the resorts at below market value. The plaintiffs in this lawsuit, however, are not the broke developers as we would usually suspect -- and they are not the appraisers' clients or anyone that the appraisers might have imagined as being intended users of their appraisal reports. The plaintiffs are wealthy individuals who purchased homes or lots in the resorts that were master-planned by the developers to whom Credit Suisse lent development funds.